Syrin found out about Steampunk in 2009, which blossomed into a love of Anime, Comic, and Horror conventions (and the cosplays that followed!) 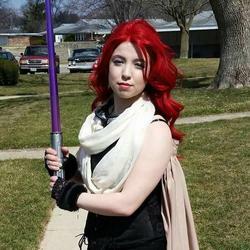 If not crafting and cosplaying, she can often be found playing fantasy-style RPG videogames, playing music, or dancing. Syrin actually started learning Middle Eastern Dance (bellydance) in 2010 and adapted her own version of fusion not long after.